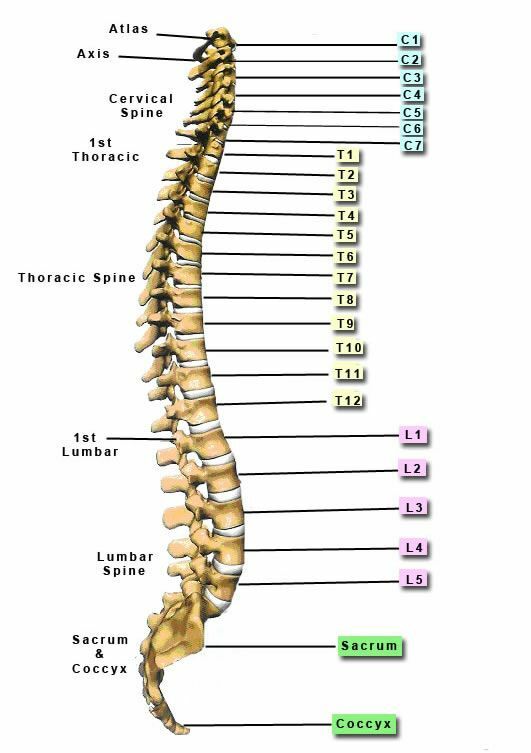 The spine can be divided in to 4 parts. The uppermost is the cervical region, consisting of 7 small vertebrae that form the neck. As we move down the body, the next 12 vertebra make up the thoracic region or mid back from which the ribs are hinged. The 5 lumbar vertebrae are the largest of the mobile vertebra and supports 2/3 of the body’s weight. The lowest region of the spine is the sacrum and coccyx. The sacrum is a triangular plate made up of five fused vertebral segments while the four coccyxes terminate the bony spine.